We were the five of us. Fresh into our career, full of energy and quite full of politics. It was March of 1971. Bangladesh resounded with the spirit of freedom. We had had enough. We would want nothing short of total independence. As I utter the word independence, I cannot help but digress to a recent conversation I had with a foreign journalist on the issue of independence vs. freedom. He was asking me why we called our war of independence a war for freedom. I explained that ours was a war on multiple fronts. It was a total war for emancipation from iniquities as dictatorship, immorality, communalism, deprivation, bigotry et al. Therefore, the scope of our war was far wider than just addressing the issue of political independence. However to get back to 'now' forty years back, people in what was known as East Pakistan then would not accept anything short of a total independence. 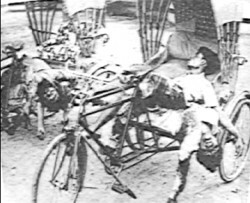 By now those who have read or followed the history of how Bangladesh came about will have known the history of March of 71 starting on the 1st leading up to the night of the 25th- when the Pakistan army cracked down on the innocent unarmed population of Dhaka, who were seeking a redress to their fate. A fate that was plagued by misery, exploitation and dictatorial onslaughts. We saw Bangabandhu Sheikh Mujib trying his best for a peaceful transition to democracy. He wanted Martial Law to go and people's rule to prevail. He went for a series of talks with General Yahya Khan, leaving no stone unturned to avoid confrontation. He knew that should the talks fail and armed conflict begin, it would mean unbearable suffering, pain and a bloodbath of innocent Bengalis. But the design of the Pakistani dictator in cahoots with Zulfiqar Ali Bhutto, the founder of Pakistan People's Party, were predetermined. They had decided to thwart by any means, emergence to power of a Bengali leader. In those days our hub used to be a room in the science annexe building of the University of Dhaka where we used to play chess, drink gallons of tea and raise storm on the tea cups on issues of politics or otherwise. March of 71 was no different. The political situation made our hub even more vibrant. The heated arguments could be heard from quite a distance. Balai, the custodian of the cafeteria in that building, was always on stand two for continuous supply of his bitter black tea. He was a very pleasant individual always pro-active to please us by being there even at 10 o'clock at night. At times the five of us were not necessarily all by ourselves. We used to be joined by other likeminded young men and the group in that small room inflated. To our delight, from the beginning of March there used to be cultural performances on regular basis every evening at the Shaheed Minar, bang opposite the science annexe building. These performances used to feature plays with nationalistic fervour, similar songs and recitation from relevant poems. We used to amble across the lawn in front of the annexe building and join the audience. There were quite a few significant days that really featured fiery programmes, two of them being 3rd and the 7th of March. On the 3rd of March there was a huge public meeting at the Paltan Maidan, where the students of the Dhaka University, on their own, hoisted the new flag of Bangladesh. They also proclaimed independence of Bangladesh from Pakistan. And on the 7th of March, the day that became ever so historic for every freedom loving Bengali, Bangabandhu Sheikh Mujibur Rahman gave a Clarion call from the colossal dais at the race course maidan, in a mammoth public meeting attended by hundreds of thousands of people. He said “the struggle this time is the struggle for freedom. The struggle this time is the struggle for independence.” These significant events emanating from the two congregations reverberated through the length and breadth of the country. Obviously the reflection was also clearly seen in the evening at the Shaheed Minar. The number of attendees was so many that they blocked the road in front and went further down to sit on the lawn of the annexe building. These cultural events went on at the Shaheed Minar and our conversations centred on what we would do in case the talk between Bangabandhu and General Yahya failed. Like many other young people we also thought that an armed resistance was necessary and this resistance could only come from the civilians. So, between 1st and 25th of March we did two things. We read all books relating to such uprisings as in Soviet Union, China, Cuba and Bolivia. We also read some books of Netaji Shubhash Chandra Bose. Names like Vladimir I Lenin, Mao Tse Dong, Fidel Castro and Che Guevara became exceedingly popular with us. The other front was to prepare ourselves to launch a resistance against the occupation army if they dared crack down on us. A friend of a friend of ours was suggested by someone to have the knowledge of making hand bombs by putting together explosive powder and other ingredients. So, we commissioned him to make a sizable device for explosion so that the Pakistani tanks could be ripped apart. These were innocuous and absurd plans. Little did we know the fire power and skills of a well trained occupation army at that time. If we did, we would not have dared an adventure like this. But let us keep this for the last night of today's column. When the device was made, the five of us plus two went with the package to have it field tested. We placed it within an abandoned steel water tank in front of the British Council office in Fuller Road. The tank was placed there to create a barricade against the possible invasion by the Pakistan army. After that, we went a little far and by striking the end of two wires exploded the device. There was a booming sound. The crows at 11pm of night woke up from their slumber and flew away croaking. We came back to see what happened and were suitably pleased that the device had worked. The tank was ripped apart. A still from Kawsar Chowdhury's “Tale of the Darkest Night”. The talks between Bangabandhu and Yahya failed. Our worries increased manifold and correspondingly the activities on the Shaheed Minar grew more intense. On the night of 25th at about 9:30 suddenly the performances at the Shaheed Minar stopped. Since we were very busy debating on various issues, we did not notice the silence at first. At about 10 we realised that the area had become deafeningly silent. We came out of the room and discovered the Shaheed Minar standing alone without a soul around in pitch darkness. We came out and there was nobody to ask what had happened. We felt uneasy and decided that we should go to Bangabandhu's residence at Dhanmondi to enquire about what had happened. En route in front of the Rokeya Hall where a huge tree was felled earlier in the day to create a barricade for possible movement by the Pakistan army was being sliced and removed by a group of army men. We saw two trucks full of soldiers armed to the teeth guarding the activity of their compatriots. We quietly drove across the opening of the barricade. We were really surprised. Because from 1st of March nobody from the Pakistan army would come out of the Dhaka cantonment. The sign was ominous. When we reached Bangabandhu's house it must have been 10:15 or a shade later. There was not a soul except the solitary guard in front of the closed gate. On inquiry the guard told us that all the leaders had come, met with Bangabandhu, received his instructions and had left. He also told us to go away in search of safe refuge because the Pakistan army were about to crack down and Bangabandhu had already declared independence. We went to Moghbazar. Most of our friends lived in that area. I dropped them there and I drove to my home in Rajarbagh. I had barely washed up and sat down to have my meal when a commotion could be heard from the main road by the Rajarbagh police line. I left my food, washed my hands and sprinted a 100 yards from my home in the lane to the main road. We saw policemen mostly in shirts and lungis with 303 rifles begging all people assembled to go back home. They said that the army had started for the EPR Headquarters at Peelkhana and the Rajarbagh Police Line. They also said that if we crowded the street, we would get killed and they could not fight back. So, I came back home. I had barely reached home when the crack and boom of the small arms and heavy artillery being used by Pakistan army was clearly heard. It was coming closer by the second. Rajarbagh Police Line was surrounded from Malibagh, Shantinagar and Motijheel Colony side. Within minutes all hell broke loose. The shelling and firing at the police line became so intense that we had to plug our ears with cotton wool. Against each sound of 303 bullets fired by our valiant policemen, there came volleys of shots from small arms, mortars and heavy guns from the tanks. By 2 am the entire police line caught fire. The heat was so unbearable that we had to douse the exposed parts of our bodies with wet towels. Slowly the sound of shots simmered down. We climbed the stairs to our terrace; our bodies wrapped with wet towels and could clearly see that there was nothing left of the barracks of the Rajarbagh Police Line. It was about 4.30 in the morning. As we came down I heard a knock on the door leading up to our apartment. I went down and whispered “who are you?” in reply a voice said, “we are the police”. I opened the door and found two policemen in naked bodies with just loin cloths wrapped around their waist with two rifles in their hands. 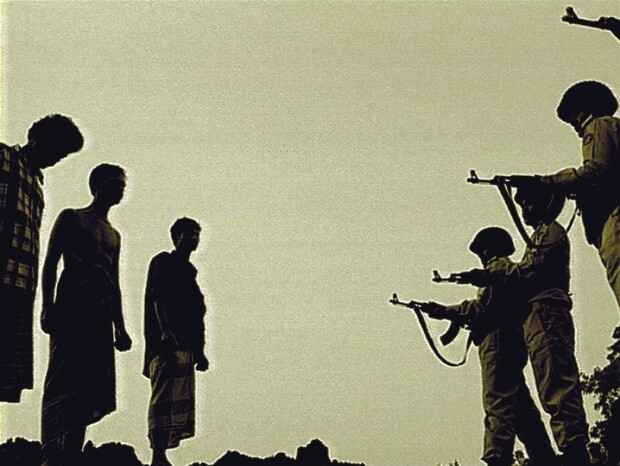 They handed over the rifles to me and said, “we have run out of bullets. Many of our comrades have laid down their lives fighting to the last bullet. Please dispose of these rifles. We promise to come back again soon and fight the Pakistan army to liberate our country. Joy Bangla!” They melted away in the darkness of the night. I could not move an inch. With these two rifles in hand I ambled across to the swamp behind the back of our house and immersed the rifles there. I kneeled down by the swamp and started crying in despair until the sun appeared on the eastern horizon. Its light was giving me a new resolve to go away and prepare myself. For, I had battles to fight and a war to win.